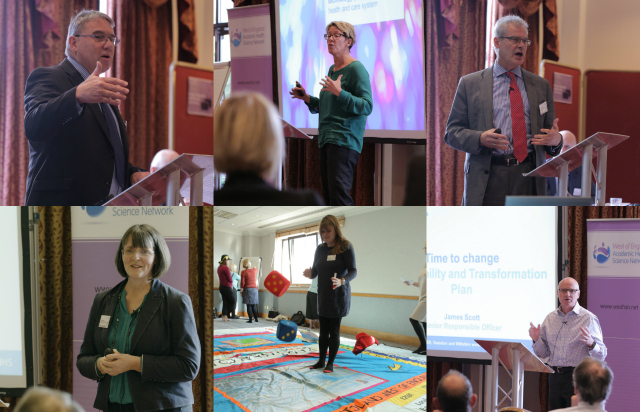 The spotlight was on Sustainability and Transformation Plans (STPs) at our annual conference in October, attended by senior leaders from across the regional health and care community, industry partners and colleagues from organisations such as NHS England and Health Education England. The conference was a great success with plenty of good conversations and inspired ideas generated by the workshops and plenary sessions. One of the key aims of the event was to consider how the West of England AHSN might best support our STP communities going forward to take advantage of the opportunities and tackle the challenges in delivering their plans to achieve the Five Year Forward View. The ‘convenors’ for the three STPs in the West of England (James Scott – Bath, Wiltshire, Swindon; Robert Woolley – Bristol, North Somerset & South Gloucestershire; and Mary Hutton – Gloucestershire) shared updates on the progress and challenges being faced by each of our health communities, and encouraged delegates to use the day to share and learn from each other and from experts with insightful experience in leadership, cross-organisational culture change and delivering place-based systems of care. You’ll find the full programme of speakers and workshops here, while the presentations are here. Watch our short video for an overview of the day or relive the day in tweets via Storify.